Kensington, Brooklyn: NYC Icy NOT closing! I spoke with someone at NYC Icy the other day and asked if there was any truth to the rumors that they'd be closing for the season and possibly/probably not opening again. She informed me that they wouldn't be closing at all! Lemon Basil Ice in December! This is wonderful news for a great local business that has struggled a bit since arriving in (well, near) Kensington. If you still haven't made the trek, you really are missing out. It's some of the best water ice I've ever had, and for $5 they make a pretty mean shake too. 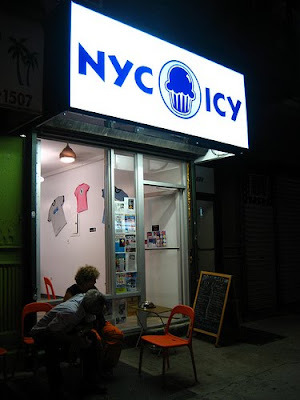 NYC Icy is located near the corner of Church and Coney Island Avenues.